Lively, peaceful fish that is mostly active during the evening and the night. The substrate should be sandy because they dig in the sand looking for food. Plants should be anchored very well. The aquarium should be set up with roots and driftwood because they need hiding places. Regular partial water changes are required and a dimmed light is appreciated. When you keep them alone they become very aggressive to other species. You should feed them live or frozen food. They barely eat dry food. 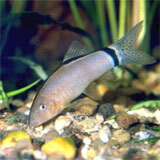 The larger female carries fertilized eggs between her ventral fins and deposits them on glass panes, leaves or stones. Fry are easily raised in a well-established tank with a layer of mulm.